Wait a minute! Local Boards don’t do that! I talk about a wide range of subjects and share a lot of different ideas about things that are important to me. Ideas that I believe are important to the future of our city. I’m well aware that I won’t have direct control over most of this as a Local Board member, but to me it seems important that we have voices at all levels of local and central government all thinking in the long term and advocating for options that will improve our city’s future. Options that will make our lives here in our city better. It perhaps also gives you some idea of what the guiding thoughts that I have are so you can have some reasonable expectation of how I’ll vote, and what I’ll support, if you do choose me as one of your Local Board members. I was asked by Spray Free Streets for my position on glyphosate containing herbicides, I was aware of the controversy but it’s not something I have a strong policy on – as you know I’m most interested in transport and housing. We need to take this potential hazard seriously. It’s frustrating that the NZ Environmental Protection Authority disagrees with the WHO on the hazards of glyphosate, and that the WHO seems to disagree with itself. Because right now there’s a lot of confusion and uncertainty, and we all just want to know if it’s dangerous or not. While investigations continue we need to be extremely judicious about our use of any potentially nasty herbicides, if we even continue to use them at all. The various alternative weed control methods that council already uses – like steam, hot water, mechanical weeding, and plant-derived chemical herbicides – simply aren’t always as effective as the nasty chemicals are, depending on the target species, but I don’t want council workers and contractors, our fellow Aucklanders, our pets, and most especially our children placed at any unnecessary risk just because it’s convenient. If we can find a safe effective replacement we need to use it. It’s a concern to me that there are such big questions around glyphosate because it’s very widely used, and as I said in my reply above it’s frustrating that there’s nothing remotely like consensus on this. I think council’s approach is probably pretty reasonable right now, and they say that when they need to use these sprays in playgrounds (for example) they try to time that carefully to minimise any potential hazard, and they use the (frankly much less effective) alternatives wherever they can. But it would be better to use herbicides that don’t have such serious safety questions swirling around them. I’m just not sure if such a thing is actually available for us to use. We don’t use herbicides for fun, we use them because we have a job to do, and that job needs to be done effectively but we owe it to everyone to do that job as safely as we can. » Read the Science Media Centre’s glyphosate weedkiller briefing document for more info, straight from the horse’s mouths. A quick note: My thinking on light rail is heavily informed by Auckland Transport‘s published investigations and reports, and also by following Transport Blog‘s many discussions of the subject over years. I’m also a believer in some of the promises of the Congestion Free Network, but their ideas lean more on buses and less on light rail than I’d prefer. 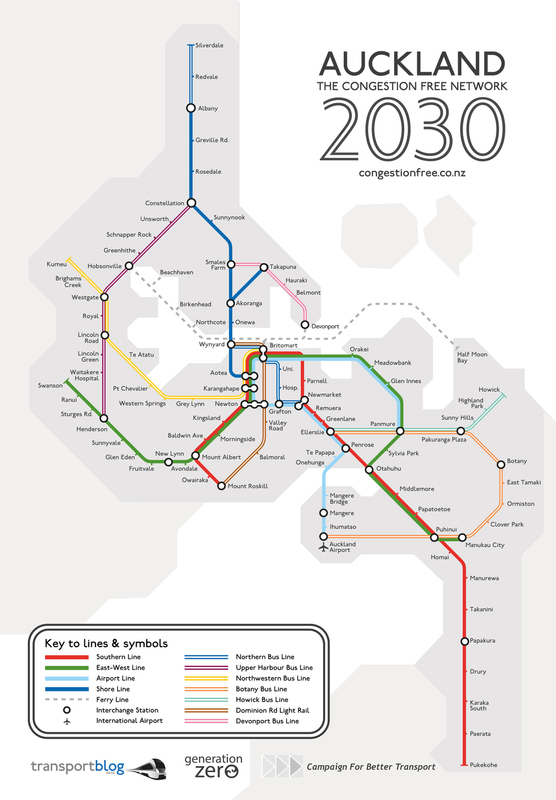 The image above is one of Auckland Transport’s proposed future transport network maps for 2045, the four spurs down through the central isthmus (to Owairaka, Mount Roskill, Three Kings, and Onehunga) and one line across the harbour to Akoranga are light rail lines. You can see they also plan for a new Light rail line, though this is on a different time scale from Auckland transports proposal above, so they only have a single light rail line, this one going from Queen St, down Dominion Rd through Balmoral and terminating at Mount Roskill, where it would join up with the Southern Line rail line. These are both fine ideas, and very important long term plans, but my addition is that we also put in a tram line essentially replacing the current Inner Link route. This would provide us with a light rail link fed from Britomart at the bottom of town, through Three Lamps, along Ponsonby Rd, and along K Rd, where we could allow transfers to the rail network via the new City Rail Link station, then continue past the hospital, through Newmarket, past the museum and down through Parnell back to Britomart. The only major stops it doesn’t go directly past Auckland University or AUT, so perhaps some slight deviation could be made. Now yes we do of course already have a bus running this route, but these roads will become ever more congested over coming decades and trams/light rail have higher throughput than buses, they’re simply more efficient, so I feel like this would be a really fantastic journey that would be taken by thousands every day, what do you think? A few more notes: There is a large and important distinction to be made between trams and light rail, trams are at street level and share space with other road users, light rail can look quite similar but has its own space – either a dedicated right of way, or preferably physical/grade separation from other traffic. This means light rail can move much faster than surrounding traffic and isn’t bound by congestion in other transport modes. Separate light rail has three times the maximum capacity of a dedicated Busway, at 18,000 passengers per hour – which is to say that you’d have to put in three northern express busways to match the throughput of a light rail pair, even though light rail could be installed in the same space taken up by the busway. It’s really efficient. This means you can get more people where they want to go, on time, and in comfort. And by design it can be very safe for other road users (naturally great care needs to be taken in how you design any intersections where other traffic crosses over the lines). If you’ve only ridden the Wynyard Quarter or Motat trams then please know light rail is nothing like those. They’re historical artifacts and would be a cramped, pokey, and slow way to get around. I can’t even fit my knees in the seats and I’m only 6 foot tall. No one advocating for light rail is advocating for that kind of tram to be used for anything other than a curiosity for tourists. I’ve used modern light rail in Japan, Belgium, and Australia. It is fantastic, it’s very fast and very comfortable. In some respects it isn’t all that different from from taking a modern train, except that it costs a lot less to install the infrastructure. There are no two ways about it, Auckland was a public transport city. People have always driven of course, but the way many people got around was on the electrified tram network that our forebears built and enjoyed from 1884 (beginning with horse drawn trams, and with electric trams introduced in 1902) right up until 1956. Now you have to be pretty old to really remember the tram network, and I’m about 20 or 30 years too young to have seen it in operation, though I do remember some bits of line were still visible when I was a child in the 1970s and 1980s. But many of us know that there used to be a lot of trams around, perhaps without being able to fully visiualise just how many, then a year or so ago designer Cornelius Blank decided to make a modern metro-style transit map of the network. I think it really drives things home using a design language that many of us find easier to relate to than the more old-fashioned network maps that were previously available. It breaks my heart to look at that network and imagine how different Auckland would be today. The lines were everywhere. You could take a tram to Parnell, or Meadowbank, or Ponsonby, or even much further afield to Avondale, Mt Albert, or Onehunga, and there are stories that the trams were so popular and convenient that you’d often be able to see the next tram coming when you were getting on the one already at your stop. But then in the 1940s and 1950s in a move of vandalism on an epic scale the lines were all closed, then the rails were gradually ripped up or paved over. Now, to be totally clear about this some of the tram lines were economic failures – there weren’t enough people for them to operate. The Devonport line in particular lived and died over just a couple of years – but it was a horse drawn line in 1880s Devonport, 70 years before the harbour bridge opened up the shore. But other lines, popular, successful lines, were also shuttered and destroyed, with the now nameless bureaucrats claiming that we’d have a more modern transport network if we adopted diesel buses rather than continuing with the clean electric trams. We now know with the certainty of hindsight what I’m sure many knew back then: this was a preposterous notion and a failure on an historic level. But it’s a failure that we can start to correct if we wish it. It will take time, but we can do it. 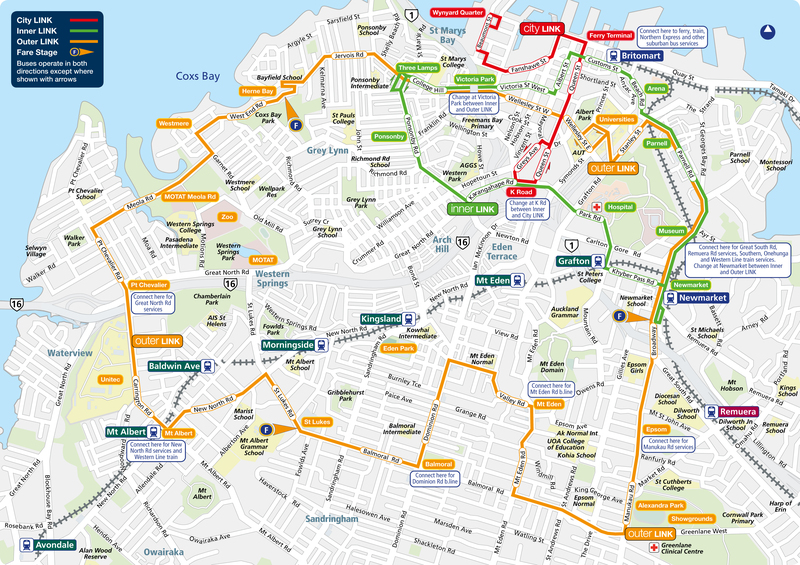 Metro-style Auckland Historical Tram network map created by Cornelius Blank, used with permission. I’m running for a place on the Waitematā local board and not everything I’m going to talk about is within the purview of local boards, but so what? We’re talking about running a city, it’s a long game by definition.